Tenzin Tsundu was born in an upper-class family named Shon-drang in 1956 in Shigatse, southern Tibet. His family had close ties to the Panchen Rinpoche, the spiritual head of the great monastery of Tashi Lhunpo. The town of Shigatse, which lay adjacent to that monastery, was the capital of the southern district of Tibet. Tibet was invaded and overrun by Communist China in 1959. The attack on Shigatse was particularly horrific. Thousands of Tibetans lost their lives, many suffered torture, and hundreds were transported away into detention camps where they were forced into slave labour. Tenzin Tsundula's father was one of the victims. Until recently Tsundula believed that his brother had suffered the same fact, but apparently he is alive and well in Tibet – although Tsundula hasn’t yet been able to contact him. When the Chinese came, they made the Panchen Rinpoche their prisoner. The monks of Tashi Lhunpo were dragged from their home, beaten and tortured. Those who resisted were publicly humiliated and killed. Those men and women who went into the detention camps were not only made to work at grueling forced labour, but had to endure daily beatings and systematic torture. When the invasion began, Tsundula's father arranged for his mother and sister to flee on foot across the Himalayas into India, taking with them baby Tsundula. The journey was unbelievably hard and the escape party lost many of its members due to starvation, terrible weather conditions, the ruggedness of the terrain and constant attacks from Chinese snipers. Tsundula's sister was one of the many children who died en route. Harassed by Chinese army platoons intent on killing all escapees, and suffering from appalling conditions on the stark plateau of southern Tibet, mother, baby and one aunt managed to barely survive. Only after unbelievable suffering were they able to cross to safety. In 1959 conditions for the refugees were made particularly severe by lack of medical and relief care. Once they made it to India, they were faced with the terrible state of the refugee camps where dirt, disease and lack of food made life unbearable. It was under such horrendous conditions that Tsundu went through the early years of his life. Eventually Tsundula's mother settled in Dharamsala, northern India, where the Indian government so kindly gave refuge not only to His Holiness the Dalai Lama, but also to great numbers of Tibetan refugees. Deeply religious even as a child, it was there at age eight that Tsundula enrolled in a monastery of the Sakyapa Order. For the next three years he eagerly studied the basic spiritual practices of that great tradition. Even as an eleven year old he already showed intellectual brilliance. Tsundula's aunt however, wanted her son to serve His Holiness the Dalai Lama. Since Tsundula already was demonstrating the capacity to be a top student, he was transferred to Namgyal Cho-de, His Holiness's personal monastery. Under the guidance of selected teachers, he underwent one of the most comprehensive spiritual trainings ever organized. Tsundula completed studies and foundation practices not only in the Gelugpa tradition, but in all four of Tibet's distinctive schools. He avidly studied and learned to practice the spiritual systems of the Sakyapa, the Kagyu, the old Nyingmapa, as well as that of his own Ganden tradition. At Namgyal monastery the students were taught the complete range of Sutra and Tantra along with such special exercises and recreational pursuits as sand mandala making, butter sculpture, sacred arts, religious dance, ritual and healing practices. Skill in philosophical debate was a priority. Of major importance was training in meditation combined with philosophic understanding. In 1983, Tsundula graduated top of his class with a full Geshe ("doctor of philosophy") degree, the highest degree of scholarship recognized in Tibetan Buddhism, and His Holiness the Dalai Lama certified him as a full master of Sutra and Tantra. We are told by his classmates that Lama Tsundula was particularly proficient in understanding the profound logic of Nagarjuna's Madhyamaka teachings, so much so that other students looked to him with awe. Lama Tsundu is today an expert at explaining the great Lam Rim spiritual path originally taught by the early fifteenth century Tibetan saint Tsongkhapa. He is also a skilled practitioner of Dzogchen and adept in the mysterious secrets of mantra. Tsundula's practice is deeply devotional. He has a profound understanding of Mahamudra meditation and concentrates especially on his practice of the twenty-one aspects of Green Tara. He is also expert in the spiritual systems of the Healing Buddha practice. After graduation Tsundula began traveling around the world as senior monk in attendance on His Holiness the Dalai Lama. This close association, lasting many years, means that he still has a uniquely intimate connection with His Holiness to the present day. The love that His Holiness has for Lama Tsundu is touchingly profound, and the love that Lama has in return for His Holiness is something deeply moving to witness. This is an unbreakable spiritual bond, rare to find in our modern world. On his Holiness the Dalai Lama's first performance of the Kalacakra Empowerment in New York, USA, Tsundula was present at his side, overseeing the organization of shrine, religious ritual and sand mandala. It was also there that he performed the famous Black Hat lama dance, witnessed by many hundreds of attendees. Tsundula has been assistant to His Holiness in some eleven or more Kalacakra performances, traveling with the Dalai Lama all over the world. He has been in Ladakh, Bhutan, Sikkhim and throughout India, besides many western countries. When His Holiness the Dalai Lama performed Kalacakra Empowerment in Ladakh, Lama Tsundu assisted. After Dilgo Khyentse Rinpoche passed away, Lama Tenzin Tsundula went as emissary to attend the funeral in Bhutan. He played a major role both during the funeral and in helping to afford comfort to the royal family, with whom Dilgo Khyentse Rinpoche had an intimate connection. Lama Tenzin Tsundu came to Canada in 1993 where, on Vancouver Island, he has up to now dedicated himself to teaching Dharma and helping all who come to him. In his own unassuming way, Lama has been spreading the Buddhist teachings, guiding people in their practice, and giving blessing ceremonies. He is a proven master of spiritual prayer who has helped so many through conducting birth, naming, marriage, healing, house blessing, exorcism and funeral rites. 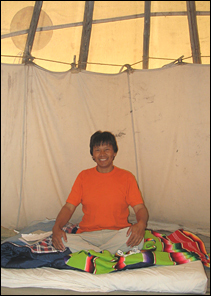 Tsundula teaches, performs ceremonies, builds sand mandalas and guides meditation. He frequently travels to other Centres on invitation for the purpose of giving teachings. Lama Tenzin Tsundu spent much time with Geshe Kalden in Calgary, Alberta, and kindly performed the transference of consciousness meditations and funeral prayers when Geshe died. 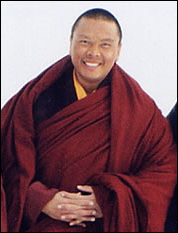 He remains closely associated with the Calgary and Edmonton centres that Geshe founded. Tsundula leads meditation groups in recitation of the mantra of Avalokitesvara, focusing on the development of compassion and awakening the human heart through devotion. Not all of Tsundula's activities are religious. He travels from place to place where needed to share Tibetan culture with people in the West. He is often involved in multicultural events and also supports the movement for the freedom of his people. Geshe Lama Tenzin Tsundu is exceptionally modest. He prefers to call himself simply a "Dharma friend" rather than a teacher and it is surprising how few — even in his hometown — know either how really learned he is, nor what a wonderful spiritual practitioner they have in their midst. Four four years Tsundula was a resident Lama at Kathok Gonpa Clear Light Retreat, a Nyingma Buddhist centre near Parksville, Vancouver Island in British Columbia. In January 2013 he moved to BC's Sunshine Coast where he is the first resident Tibetan Buddhist teacher in this area.